Most earth structures such as adobe are located in hot, dry climates. But what if you live in a cold climate and want the benefits of low-cost earth building techniques? Earthbag building has the unique advantage of providing either thermal mass or insulation, and therefore can be adapted for cold climates with an insulated fill material. Most earthbag buildings use grain bags filled with soil. The bags are filled, stacked in courses much like bricks and then tamped solid. One or two strands of barbed wire between courses help hold the wall together. The building process using an insulated fill material would be nearly the same, although the bags would weigh significantly less. The table below compares the approximate R-values of three sustainable insulating materials that could be used in earthbags. (The first column in the table is the insulative value per inch; the second column shows the R-value for a typical 15" thick earthbag wall.) These materials are natural, lightweight, easy to work with and non-toxic. They will not burn or rot and do not attract insects or vermin. And because these materials are not adversely affected by moisture, they can be used as part of earth-bermed structures. Another excellent insulator is scoria, also known as volcanic rock or lava rock. Due to its volcanic origin, scoria is filled with tiny air spaces, making it a good insulator. 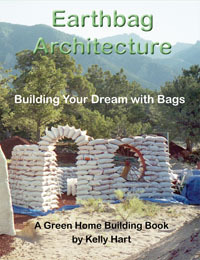 Kelly Hart pioneered the use of scoria-filled earthbags on his home and shop in Crestone , Colorado . Although the R-value of scoria is debatable, Kelly estimates his earthbag walls are comparable to straw bale walls of around R-26 to R-30. (This estimate includes 5" of papercrete at approximately R-2/inch.) See this page. Another possibility is to add a seam lengthwise down earthbags or polypropylene tubes to divide them into two compartments. The outer part could be filled with insulation; the inner part with soil. This would create an insulated wall with thermal mass on the interior. The placement of the seam could vary, depending on the climate. In a mild climate like New Mexico, I would add about 4"-5" of insulation on the outside. This would provide about R-10 insulation. In a slightly colder climate the seam could go down the middle (50% insulation/50% soil). In extremely cold or extremely hot climates I would fill the bags with 100% insulation (or all earth in the desert if insulation wasn't available). One could also build a double-wythe earthbag wall with insulation in outer bags and soil in interior bags, however this would increase the cost and labor.